Can anyone recommend OCR software to process invoices of PDF interactive form? Question: I need OCR software that can read a variety of types of invoices and extract data. The exported data should be presented in a tabular format like Excel, CSV or table PDF, preferably with a link to the source document. It must be able to read the documents in a variety of formats (.PDF, .jpg, .gif, .tiff, etc. ), please note there are some of PDF which are kept in PDF interactive form. Is there such application on VeryPDF? Answer: When you need to OCR invoice from a variety of formats (.PDF, .jpg, .gif, .tiff, etc. ), maybe you can have a free trial of this software VeryPDF Table Extractor OCR. It can help you fulfill at least the following operations: A: support a variety of formats (.PDF, .jpg, .gif, .tiff, etc.) including the PDF interactive forms, it can turn PDF form to flatten PDF file and then extract data from it; B: it can allows you to save output as Excel, CSV, word. HTML and others. For now it can not output searchable PDF file. C: OCR words, number accurately. However there is a limitation, when output PDF file to word or Excel, layout will be changed a little bit but in the those application, you can rebuild the layout of invoice. 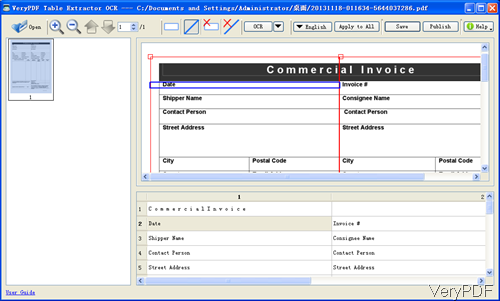 This software is GUI version, which can not OCR invoice in batch if the layout are not same. There are two versions and two types of this software. one OCR version and one version without OCR. One type could work under Window platform and the other type could work under Mac type. During the OCR, this application allows you to deskew input file, remove dirty black points from scan files, adjust image input file quality, adjust threshold and change color input file to black and white file. 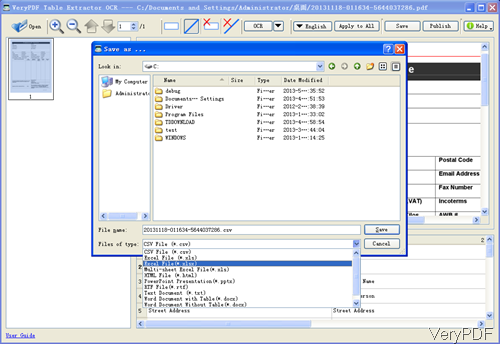 Download VeryPDF Table Extractor OCR. Here I will take the Window version for example. Please install this software by double clicking the exe and following installation message. When installation finishes, there will be icon on desktop. Simply click it to launch this software. The following snapshot is from the software interface, please have a check. Please click button Open to add PDF file to software interface. 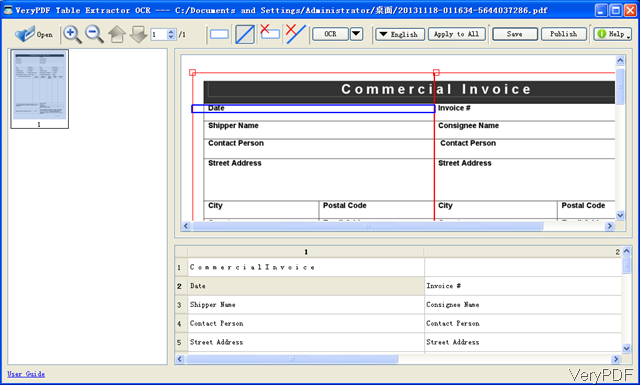 Then click icon of frame to draw area around the invoice where you need to extract data. Last please click button OCR to OCR invoice. All the recognized text will be shown below the table. 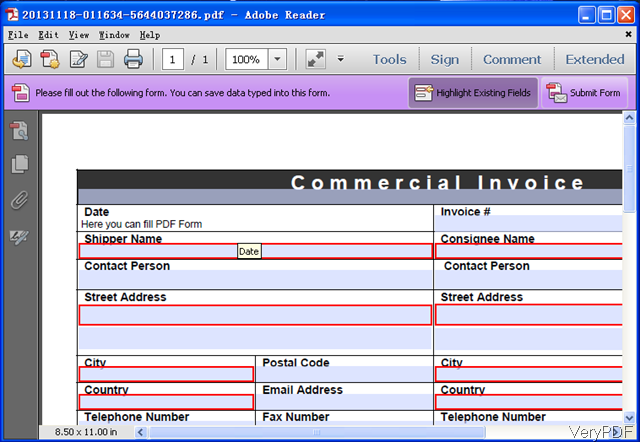 Please compare the following snapshot which is from the input interactive PDF invoice. You can edit the OCR invoice data in the bottom part. Then click button Save to save it as a new file. The following snapshot is from the Save as option, please have a check. By this application, you can OCR invoice in a variety of formats (.PDF, .jpg, .gif, .tiff, )etc. During the using, if you have any question, please contact us as soon as possible. What is the option to automatically display PDFs after creation? can you show me how it works? What is API and what VeryPDF cloud based API can do for you? This entry was posted in VeryPDF Cloud API and tagged OCR invoice. Bookmark the permalink.